Many years ago when I was still into role-playing games, and in particular into Call of Cthulhu, I came across a magazine (remember those?) with a short adventure investigating a spaceship which crashed on a planetoid and – of course – eldritch horrors were involved. Someone had even created an image for the adventure involving an old Space: 1999 Eagle – an inspired choice since that show had great visual design and was at its (modest) best working the horror genre. I wondered at the time while no one had really mined the potential of Lovecraft and space opera. Of course, lots of people have combined horror and science fiction; even before I saw that magazine we’d already had Alien and George R. R. Martin’s novella “Nightflyers” (which has itself been adapted as a film and a recent TV series on SyFy), and they’re hardly the only examples. But I hadn’t seen instances combining specifically Lovecraft horror with SF. 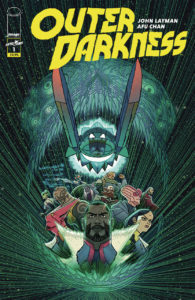 I’m sure there have been plenty of instances by now of that combination – Lovecraftian fiction is bigger than ever and there has been a lot of it written in the last 35 years – but now we have something resembling it in comic book form: Outer Darkness, by John Layman and Afu Chan. It’s working a more overt form of horror (with large doses of terror), but it is, if you will, a second cousin to that role-playing adventure I came across decades ago. And it’s one of the comics I most look forward to each month. The comic is on a slow burn to reveal its story, but the basic idea is this: Humanity has reached the stars, and there are horrible nightmarish things out there. Joshua Rigg is a former ship captain in a dead-end career when he’s asked by a fleet admiral to take command of his old ship, the Charon, to head into the outer darkness to retrieve – something. The ship now had a god engine, a ravenous being to which sentient lives have to be sacrificed to make the ship go. This is no Star Trek crew: The officers include an oracle, an exorcist, a mathematician, a mortician (! ), and various others of various species. And apparently there’s a war on. In the second issue, Rigg puts his crew through a brutal exercise to see what they’re capable of. And in the third we meet a couple of junior crew who come to a bad end – or so it seems. But this seems like the kind of universe where if something doesn’t get you in one issue, something else might in the next. The stage is still being set three issues in – we barely know anything about the characters’ pasts, or what’s going on in the universe, or what the Charon is heading out to retrieve. But it’s engaging stuff so far. 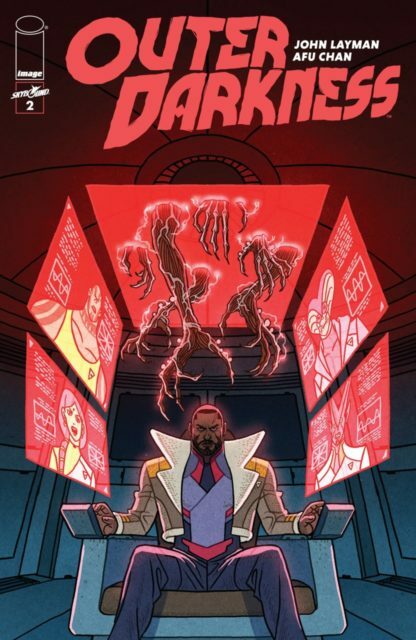 I was not a big fan of Layman’s previous long-form comic, Chew – I burned out on the shtick after about 30 issues – but Outer Darkness has a very different tone and is a solid read so far. It’s also got some fine and distinctive artwork by Afu Chan, whom I thought I hadn’t seen before, but it turns out I did buy HaloGen, though I don’t really remember it. Honestly besides the space opera/horror mash-up, the slow burn resemblance to Babylon 5 is also a draw for me. If Layman wants to make this fan really happy, this series will have the sorts of revelations and changes in direction that were the keynote of that series, so that by the end we’ll be looking back impressed by how the story got from these simple beginnings to wherever it ends up. Here’s hoping!